Shoppers in the market for modern-day muscle cars that actually match the nostalgia-inducing tall tales that we all grew up with have never had it this good. The latest SRT 392 is a prime example of this trend and its single-minded pursuit of offering big V8 thrills is a refreshing change from the politically correct downsized sport coupes that dominate the market today. For 2017 a number of changes to specification levels and some upgrades to the infotainment sum up the changes to the Challenger SRT coupe. The Challenger offers an interior that comfortably surpasses most other cars in this segment when it comes to spaciousness. The controls and buttons are all fuss-free to use and the touchscreen offers an intuitive interface. The overall quality levels are good for this segment with only the odd bit of hard plastic letting the side down. Comfortable seats up-front are adjustable to suit most sizes and the rear offers space for three as opposed to the two of most competing offerings. Trunk space is huge for a coupe and this muscle car offers a lot of practicality despite its two-door layout. The Dodge Challenger SRT is predominantly a straight-line machine and those large dimensions that give it such a commodious interior make negotiating tight and windy roads a rather tricky affair. The steering can be a bit heavy at lower speeds but the uprated suspension setting over the base models gives the SRT a level of body-control that allows it to be hustled along wider roads with confidence. Ultimately though, the dynamic abilities of the competition are one step ahead in most regards. That sport suspension means that the ride quality is firm and although it absorbs most smaller bumps without too much trouble, rougher pavement can unsettle the big coupes composure. 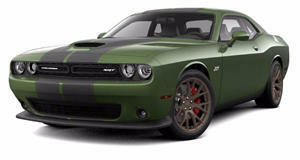 The Challenger SRT comes equipped with a 6.4-liter V8 which pumps out 485 horsepower and a substantial 475 lb-ft of torque. A 6-speed manual transmission and rear-wheel drive are standard while an 8-speed automatic is an available option. The SRT is claimed to reach the 60mph mark in around 4.5-seconds with quicker acceleration figures but perhaps less fun available with the automatic transmission. This is quick enough to match the best in class and the SRT 392 also offers a very good claimed 14/23 city/highway mpg figure, although achieving those numbers will be heavily dependent on the behavior of your right foot. The SRT 392 comes equipped with a number of items that are available on the lower offerings in the range and standard specifications include an updated 8.4-inch touchscreen, smartphone connectivity, navigation, rearview camera including rear parking sensors, uprated Brembo brakes, adaptive sport suspension, leather seats with heating and ventilation function on the front pair, and 20-inch alloy wheels. A multi-displacement system is available in conjunction with the 8-speed automatic which bypasses the gas guzzler tax. The Technology Group includes automatic high beam control, auto wipers and adaptive cruise control and forward collision warning although not in conjunction with the manual transmission. A power sunroof and a range of paint colors are also available as well as a selection of Nappa leather, suede and alcantara seat coverings. Big, brash and unrepentant, the Dodge Challenger SRT is the antithesis to the modern-day sports coupe. Packed with a powerful V8, this muscle car gives a whole new generation of motoring enthusiasts the opportunity to experience some unfiltered American-style performance. The spacious interior, great specification levels and just about acceptable ride quality make it one of the more practical offerings in this segment too.